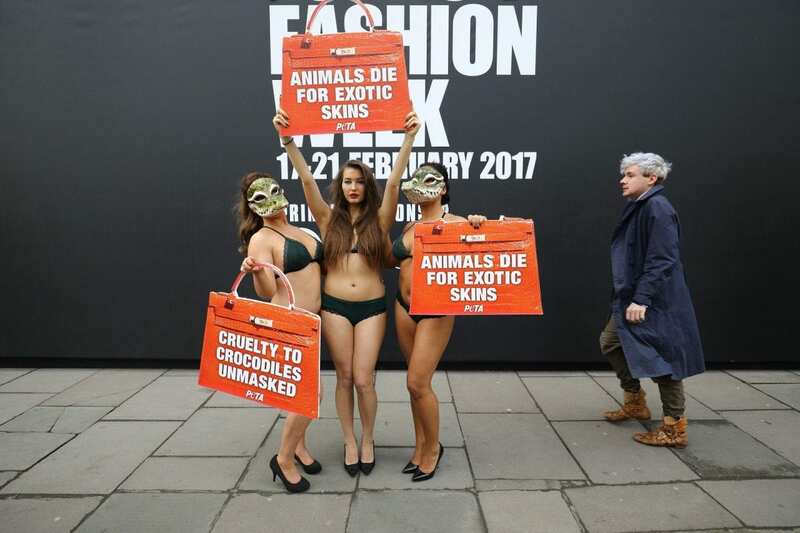 A trio of bikini-clad beauties braved the chilly capital in a bid to raise awareness for crocodiles being used in high fashion. The beauties wore fake crocodile masks as part of their snappy protest against the likes of Louis Vuitton for using their leather to make expensive bags. The action, at The Strand in central London yesterday (Fri) follows a recent exposé of crocodile farms in Vietnam by animal charity PETA. They are waging a campaign against the tanneries, which provide livings for hundreds of impoverished families, and are calling for the practise to be made illegal. PETA found two tanneries that they claim have supplied skins to a tannery owned by Louis Vuitton’s parent company, LVMH. PETA Director Elisa Allen said: “For every crocodile-skin bag or belt, animals were beaten and were likely still conscious as their skin was torn of. PETA has exposed cruelty on reptile farms on three continents, revealing in each case that intelligent, sensitive animals are forced to live in squalid conditions before being killed in violent and painful ways. According to research conducted by experts at Animal Danger, crocodiles and alligators kill upwards of 2000 people every year.